Devoid Of Culture And Indifferent To The Arts: What’s for Dinner: Moroccan Spiced Salmon with Orange Basil Salad! 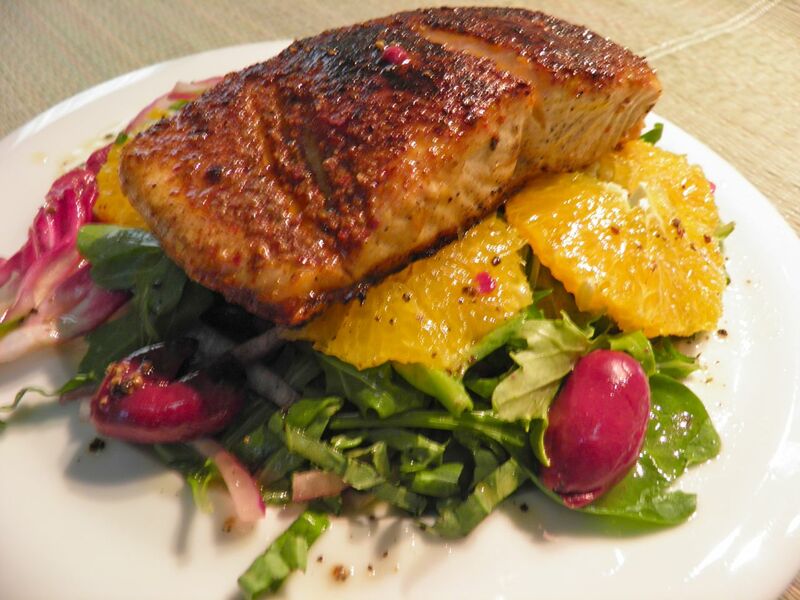 What’s for Dinner: Moroccan Spiced Salmon with Orange Basil Salad! OK. This is the first time I’ve done this. I’m going to show you what I cooked, talk about what I cooked, and tell you what’s in it. But you will have to go elsewhere for the recipe. You see, this recipe is copyrighted. I can’t tell you how to make it here. But I will send you where you need to go to find it. But I digress… I stumbled upon this creation and just had to try it. It sounded very intriguing. The recipe is for salmon crusted with cumin, cinnamon and ground red pepper. It is then seared and placed atop a delicious salad. And what a salad! Greens, basil, red onion, orange slices and black olives. The amount of basil is what got me. It's significant. The salad is then drizzled with extra virgin olive oil to finish it off. Never being able to leave well enough alone I did make two alterations. In the recipe they use cured black olives. I substituted kalamata olives because to me they have a better flavour. I also made a vinaigrette by mixing lime juice with the olive oil. Oh, and black pepper. Lots of black pepper. This was a very fast recipe to put on the table, too. End to end, this was about 15 minutes. The written cooking time for the salmon leaves the fish slightly raw in the centre. I’m not a great fan of that (except in sushi) so I cooked it a few minutes longer until it flaked and was no longer pink. It was amazing. 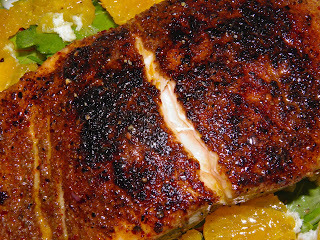 The cinnamon and cumin complement the salmon very well. I’m always glad to give credit where credit is due. The original recipe is from Radically Simple, by award winning chef Rozanne Gold. It is published by Rodale, ©2010. I bet there’s a ton of other delicious recipes in that book. The link above takes you to Amazon.com (USA site) to purchase it. For my Canadian friends, the Chapters Indigo link is here. I know I’m going to keep my eye out for it the next time I'm at my local Chapters. You should try this. It’s fast enough for weeknights, healthy beyond belief, and elegant enough for company. At the risk of repeating myself, "you eat with your eyes first." Plating and presentation goes a long way in how we anticipate a meal. Yum Darrell. I'm trying to eat more fish too. I had salmon spiced by Sobeys...not as good I'm sure. Morocco here I come.